30,000 people attended, I served 40 gallons of tea from my tiny gongfu cups to a youthful crowd, for most it was there first festival and they had never experienced tea ceremony. We had a direct view of some of my favorite drum and bass artists in the world, including Sub Focus and Camo and Krooked. It was lively at the tea lounge the entire time and I was so blessed to be able to share my arts and passion for a good steamy cup with everyone there. I had been gifted a ticket to attend this event and this was the first time in years that I was simply going to a party and not working. I was at a loss of what to do with myself, roaming and greeting friends. I sat at my friend Omar Riverstone's gorgeous mobile tea lounge for a few moments and was asked to sub a server out. I took command of a friends tea table and made some pirate tea with Desert Dwellers bumping I played with unfamiliar teas, pots and trays. It was really fun!!! Getting situated for service at Living Prism's "Goddess: Unleash the Fire", Portland OR. Getting social with my guests, the teahouse was packed my entire shift and I got to meet lots of new friends from the Portland area. Filling the cups of attendees at this thoughtful event hosted by my friend Dar of Living Prism. So awesome that a man put together a event that was to honor the Goddess in each of us. I had a lovely time! Having some afternoon tea with a spirited little girl at the community driven riverside festival Cascadia in Granite Falls WA. Mischievous moments in the tea lounge at Cascadia Arts and Music Festival 2016, Granite Falls WA. We were right across from the Jellyfish Cove stage and had front row seats to all the action from the tea lounge. Had a great time setting up with the lovely Lily Le and we had many memorable tea parties throughout the weekends. Got to party with the Welsh Brothers and many other scallywags and wenches. GYPSY VIBES would love to bring her tea lounge to your next event! Look over the rates and options below and get in touch to book a tea ceremony for private parties, events and festivals. Read more about Gypsy Vibes and her passion for tea here. Gypsy Vibes will bring a traditional Gong Fu Tea set up to your residence and create a peaceful and vibrant setting to enjoy a worldly assortment of rare and organic teas with you and a few close friends. Gypsy Vibes will bring a traditional Gong Fu Tea set up to your Private Event and depending on the theme of your event she will create a custom tea lounge for you and your guests to experience a wide variety of gorgeous teas and socialize. This is perfect for events that would like an alternative to a bar. Rates are dependant on the size of event and duration event. 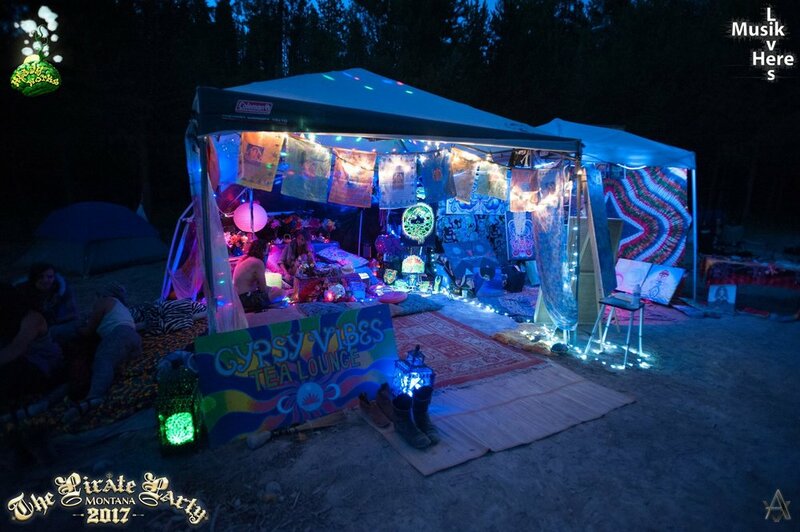 Please contact Gypsy Vibes to book the tea lounge for your next public event or festival.